From time to time I visit Richard North's padded cell, but over the past year there has been no progress, on the contrary, just a steady decline into crazed rambling. He will remain, I fear, unfit for the society of normal humans for the rest of his days. No therapy can help him. His egomania has got much worse, steadily developing from 'monumental' (when he educated us all on the difference between strategy and tactics in a 'strategy week' that amusingly took ten days) to 'grotesque'. His latest blog post is entitled 'A personal statement', revealing a mind that believes his regular blog utterances are some sort of ex cathedra pronouncements with an authority which transcends his person. He believes even more that he alone is party to knowledge that the rest of us are either too thick, too lazy and/or too malign to appreciate. His use of the royal 'we' is irritatingly pompous. His technique of demonstrating intellectual authority over his inferiors (i.e. everyone else but him) is to surf around and dig up as much detailed, obscure and arcane information as he can. Some time ago he went through a phase of writing blog posts paraphrasing articles in the German media – a language he himself does not understand – usually therefore with puzzling results. We were never told why the German media were better than the British media. The main point here was that he was reading the international media as opposed to the rest of us plodders who just follow the doings of the Kardashians. His masterwork Flexcit is a huge compendium of arcane points, the truth of all of which he takes as self-evident (because he thought of it). Since he first created the document a couple of years ago he has edited and expanded it on an almost daily basis, prompting the question: if the current version is correct, how can its many predecessors also have been correct? The fact that he feels the referendum will be lost because voters have not been given the chance to review his thousand page masterpiece is indicative of his delusional state. Under pressure from potential partners he has produced various summary documents, but none of the major campaigns has subscribed to any of these. He is clearly hurt that no one – apart from the few sycophants to whom he grants the privilege of commenting on his pieces – cares what he says. The public recognition and acceptance that he so clearly values has failed to materialise. However, even we dullards, rowing along in his wake far behind him, have a good idea why this is. It never seems to have dawned on him. The fact is that for years he has denigrated and dumped buckets of verbal slime over anyone who fails to perceive his genius. Members of the British and European Parliaments, members of the government, media commentators, reporters and other bloggers have all been collectively and individually insulted and beslimed by North. According to North, his friend Christopher Booker is not allowed even to mention his name in his Telegraph column or refer to him directly in any way. North was recently de-invited at extremely short notice from a session of a parliamentary commission on flooding when other participants objected to his presence. If propagandizing for a cause means getting yourself banned from every public platform, North is doing extremely well. At the recent launch of his rag-tag 'Leave Alliance' in London, he tells us with some satisfaction that, of the two MPs who did turn up one left early and the other was in a visible state of rage by the end, proving for North just how stupid and lightweight these people were. It seems that in his opening speech North classified all MPs as 'bovine'. Once you have insulted someone profoundly, there is no way back: they are lost to you forever. From the moment the campaign for a referendum on Britain's continued membership of the European Union came to fruition after the Tories' election victory in 2015, his hysteria has increased almost daily. His confident prediction, based on his extensive analysis of the situation (which therefore must be true) was that, because of this rule or that regulation, years would pass before the referendum could be held and that the stupid media were jumping the gun. This prediction has proved to be completely wrong. Since the moment when the date of the referendum was announced he has been lashing out in fury at anyone who does not immediately recognise his authority and standing on the issue. Sane people will have no difficulty understanding that the buckets of slime he has thrown around so freely for so many years have caused him to be ignored by the makers and shakers on this issue. His 'personal statement' tells how he was tricked, manipulated and then ignored by the 'Vote Leave' organization, tricked, manipulated and then ignored by the 'Leave.eu' organization. His bottomless hate for UKIP and Nigel Farage means he can barely write of the 'GO' organization. His bottomless hate for Boris Johnson, Nigel Lawson and Daniel Hannan – a.k.a. Myrtle, the 'Judas goat' leading us all to our doom – and all the others he has ecumenically insulted hinders any normal working relationship. Everyone is malign or stupid apart from him. He claims now that historically the referendum topic belongs to him and that as such he cannot be ignored. As every group with which North has had anything to do has found out, at some point for whatever reason he will just kick off and start, not the five-minute argument, but a lifelong blood feud, for which reason he will continue to be ignored. The current modish word is 'toxic'. He has spent the last years shooting his nominal allies in the back and leaving enemies untouched: who would want him as an ally? Critical commenters on his website are treated dismissively, condescendingly or usually just banned. He calls this the firm management of comments. Any visitor to the site is soon repelled by the vitriolic abuse he dishes out on an almost daily basis. Everyone is a fool and a knave but he. Had he exposed himself to adverse comments and thought about them seriously the present piece would not be needed. A main plank of his strategy has been, through his equally opinionated and equally thick son (a.k.a 'howtobeacompletebastard') to create an army of bloggers supporting the cause. Effect on public opinion: none. The pair founded the 'Leave Alliance', which no other participant in the referendum debate will mention, let alone collaborate with. About £19k has been raised by the group, most of which will now go to his son, who, his formative years spent repelling bailiffs and sabotaging fee collection, seems to have no day job to give up. Does he really want to win? Although he pays lip-service to the task, I don't think Richard North really wants to win the EU referendum. A win would have been achieved without him and that in turn would mean too much credit for those whom he detests. On several occasions he has outlined his strategy for the time after the referendum is lost, which will be essentially to continue annoying and blaming everyone else for the next forty years. Recommendation: Avoid contact, keep him in his cell, consider sectioning his son, next clinical review in ten years' time. A reader writes to dispute our assertion that North is getting worse. 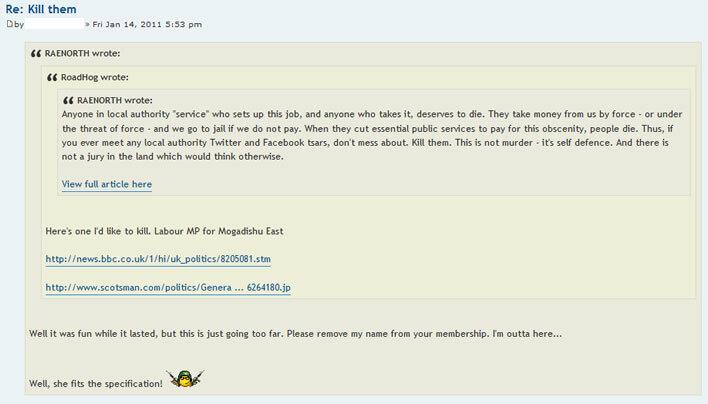 As evidence he sends a screenshot from January 2011 of the moment on North's bizarre private forum when, after several attempts at trying to stop North and his myrmidons threatening to kill people, he felt forced to resign. Duration of membership less than one month. Here's the original blog post. (the comments are no longer accessible). The snarling, asterisked statement was added after the original posting. Anyone in local authority "service" who sets up this job, and anyone who takes it, deserves to die. They take money from us by force – or under the threat of force - and we go to jail if we do not pay. When a local authority is already having problems and they cut essential public services to pay for this obscenity, people die. Thus, if you ever meet any local authority Twitter and Facebook tsars, don't mess about. Kill them. This is not murder - it's self defence. And there is not a jury in the land which would think otherwise. * And before the stupid left wingers (is there any other sort?) and other numpties start sounding off, read the comments thread, and then look up the word "polemic" in the dictionary. Lovely. 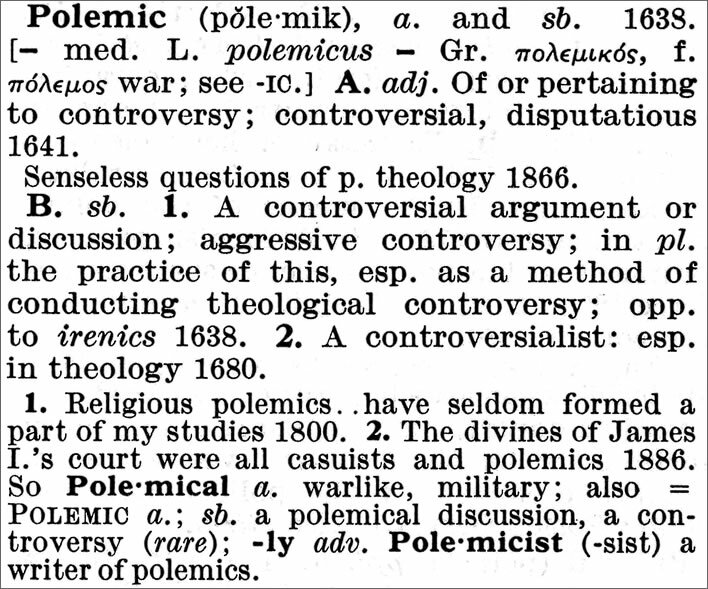 I don't see how 'polemic' covers threatening to kill people, though. Judge for yourself. Today is a big day: The Leave Alliance (a.k.a. Richard North and picked acolytes) is holding a four hour 'workshop on Flexcit' in London. Police will be on hand to control the crowds that are expected to turn up to hear the great man in person. After a brief introduction by the journalist Christopher Booker, North's longstanding friend, the good doctor will give a talk on 'Flexcit'. This will be followed by 'Question Time' in which 'the audience are the stars', meaning that they will be allowed to ask the great doctor some questions. Just in case their intellects do not prove to be up to this task or anyone – Heaven forfend! – should stray off message and ask an unwanted question, a list of ten 'guide questions' will be projected onto the screen. One of these is: 'Why isn't Flexcit getting more (any) attention from the media? ', a question that was answered in the post above. There will be scope for entertainment here, since it will be difficult for North not to kick off about the 'children' in the media, the 'bovine MPs', the 'morons' and 'liars' in the campaign and the government. Oh, by the way, just don't mention Boris, Gove, the Lawsons, Hannon, Farage (under no circumstances) – or, well, anyone other than North, in fact. So, a rough calculation of running time: Booker 5 mins, North 1 hour, questioners (total) 10 minutes, North 4 hours. Seems about right. All this will be professionally video-recorded and available for posterity – unless, of course, someone asks the wrong question. It's not mentioned in the programme, but a concluding torchlight procession seems possible. Dr North went to London.